After a two year detour to Fuji Speedway, the Japanese Grand Prix returns this Sunday to Suzuka Circuit, Honda’s scintillating test track where Ayrton Senna ran a pulverizing qualifier to take pole position twenty years ago. Defending champion Senna arrived in Japan needing a win to keep his title chances alive against teammate Alain Prost, with whom he had developed a fierce rivalry over the previous two years, driving McLaren’s dominant MP4/4 and MP4/5. This is Senna’s qualifying lap, which would earn him pole with a time of 1:38.041. There is perhaps no better footage of Formula One racing to demonstrate the sheer speed involved. Television cameras distort and slow down the cars, while modern in-car video—recorded with a wide-angle lens from a vantage point high above the driver—renders the scene with a surreality more in common with videogames than racing. Here, however, the speed is monstrous, staggering, our perception aided by a regular lens shoved right up against the driver and by a manic Senna, driving his V10-powered McLaren-Honda with fury. You get the sense that there is no single millisecond on his lap where you could control the jittery racer, driven absolutely at the limit. For a comparison, here’s Alain Prost’s (left) qualifying lap side-by-side with Senna’s (right). Prost was no slouch, but he is simply demolished by Senna here. The finish line would see them 1.730 seconds apart—a difference of 1.8 percent, a huge margin at this level. Over the course of a grand prix, a difference like that will add up to almost a full lap. In the race, Senna’s advantage would not hold up: Prost beat him off the line and developed a lead. Five laps before the end of the race—which, with Prost in the lead, would have meant Senna losing the world title—Senna made his move, but Prost cut him off. Neither of them would back down and their tangled McLarens came to a stop. While Prost got out of his car, Senna was push-started to rejoin the race, which he promptly won—only to get disqualified, handing the world championship for 1989 to Alain Prost, who left the team to join Ferrari for 1990. A year later, they’re back in Suzuka for the 1990 Japanese Grand Prix. At the drivers’ press conference, Senna is still upset. He leaves the room after a barely veiled comment by Nelson Piquet. Note: The video begins in Japanese but becomes English for the choice bits. Senna would, of course, ram into Prost’s Ferrari right after the start of the 1990 race, taking them both out of the action yet again. This time, it was Senna who walked away with the championship. 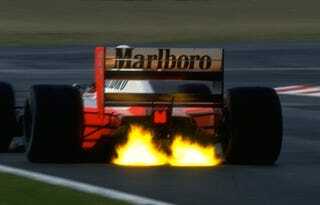 Ten years later, Senna’s scorching pole from 1989 remained an awesome feat. Watch this comparison with Michael Schumacher in 1999, who is driving Ferrari’s constructor’s champhionship-winning F399. Senna, five years dead at this point, is right up there with the German who would come to dominate Formula One in the coming years.